PAS-ties, not PAY-sties. 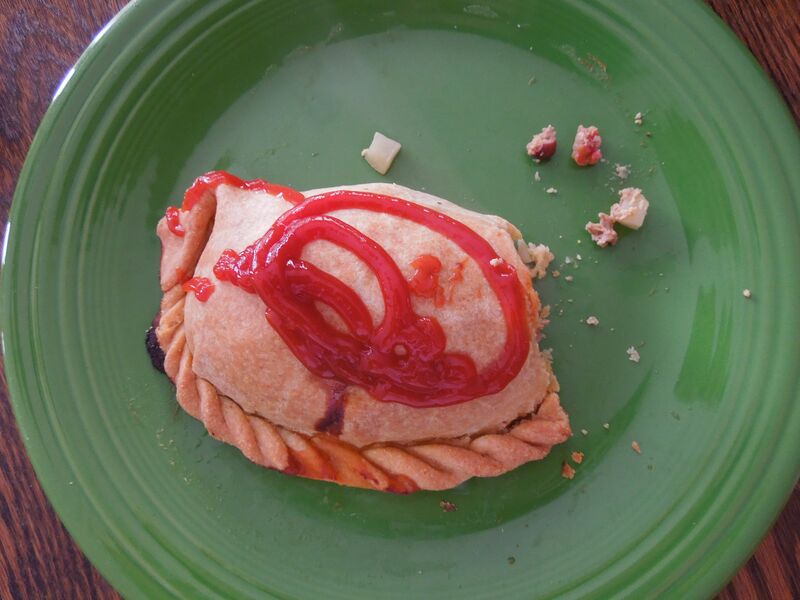 Get it right the first time, and don’t make the mistake of identifying this as an empanada or a calzone. This is certainly a pasty. How would you know? Context. I’m about to give it to you thick (description). Meat, potato, and rutabaga pasty. My first bite of a pasty was the quintessential experience–on a cold January day, in the middle of the U.P., in a lovely Yooper home that looked out onto the serene, frozen Indian River. Keith and I were visiting his mother, Sandy, whose hospitality was as heart-warming as the pasty she served us. Sandy had a freezer full of pasties for us, a mix of “regular” (ground meat, diced potatoes, and rutabagas) and, interestingly enough, “empanada” (spiced beef, corn, cheese, beans, potatoes). Each were handmade by Keith’s grandparents, Jean and Laurie, who lived just a short kayak ride down the river from his mother. The anticipation was building up for my first pasty experience after seeing all of the shops that dotted the highways from Marquette airport to Manistique. Jean and Laurie Kivisto had their own successful pasty shop in the 80’s. Colonel K’s Pasty Shop in Menominee is still around, but the original Col. Laurie K. has since signed over ownership to other Yoopers willing to uphold a regional tradition. 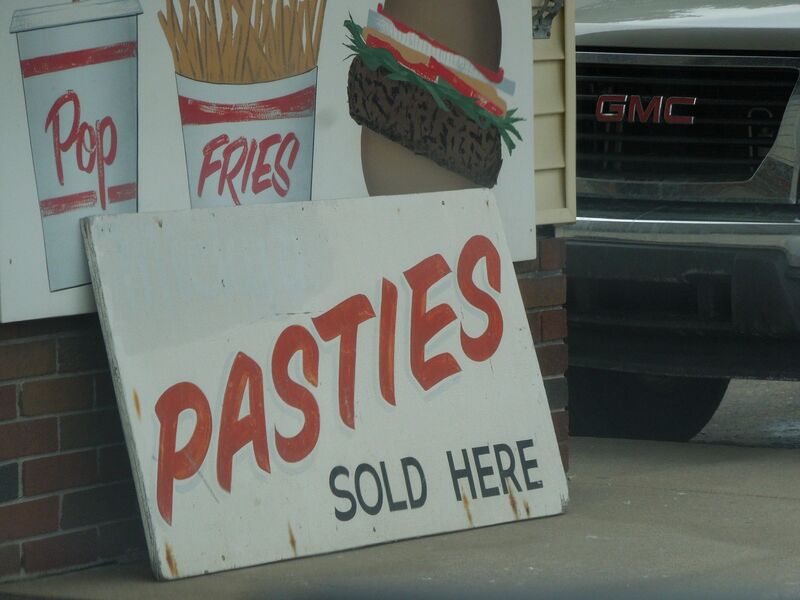 Spotted on the road: Muldoons Pasties. Pop, Fries, Burgers, & Pasties. What is this tradition? Why is this flaky hot pocket of savory, meaty goodness a staple in the U.P.? What did the pasty mean to Keith’s ancestors, Finns who immigrated to the U.P. at the turn of the 20th century? To answer this question, I use personal experiences consuming and making pasties with Keith and his grandparents, interviews with Keith and Sandy, and academic articles about the Finnish migrant experience. The pasty is a perfectly filled and crimped pocket of piping hot goodness that begs to be eaten with one hand. 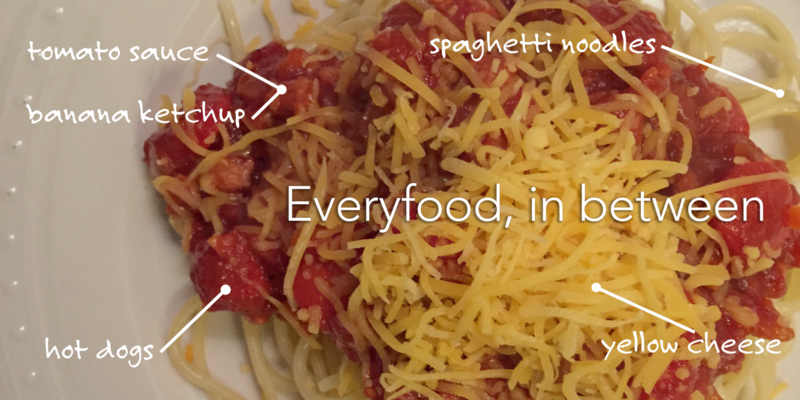 Picture yourself standing in the middle the woods on a snowy, overcast day, hungry after a long hike. You reach into your pack for a tin foil-wrapped pasty, still warm and ready for a first bite. The meaty and doughy aroma brings you back to when you pulled it out fresh from the oven. You peel off foil and sink your teeth into the crust. It’s flaky and slightly buttery. It’s not too thick, but just thick enough to hold in a healthy mound of steaming ground beef and pork, dotted with perfectly diced cubes of rutabaga and potato. This is not how I ate my pasty. It was served on a plate, with a fork. I was also offered a bottle of ketchup. I looked over to Keith and watched him squirt lines of 57 on the crust, and dig his fork into the pasty with authority and excitement. I mimicked his method and dissected the pasty. Wisps of steam instantly escaped, and I did my best to capture them with my nose before they disappeared into the U.P. ether. Eating it on a plate permitted me to appreciate its structure. The half-moon shape allowed for maximum amount of filling, and the beautiful crimped edge kept everything in its place during baking. The ground meat had the texture of the best burger you ever had, spotted with an even distribution of rutabaga and potato cubes that could straighten out any bell curve. A small slit was cut on top of the doughy dome to allow steam and liquid to escape in the oven and save you a burned bottom lip. The crust had a toasted brown color, an indication that it was not brushed with an egg wash before baking. Egg washes give pastries and pies a golden brown sheen, but not this pasty. Grandpa Kivisto did not mess with superfluousness. The pasty is an honest dish. Its functional features are the source of its beauty. Upon closer inspection, I noticed small, translucent ribbons of onion and specks of black pepper. That’s all she wrote: beef, pork, potatoes, rutabaga, onion, salt, and pepper–an ingredient combination that seems inherently boring and unimpressive, yet packed a savory punch of rich, deep flavors, incubating together in a perfect ecosystem of hot pocket-ness. But how did this Yooper tradition begin, and why did it change? Emigrants from Cornwall, England, played a vital role in the development of Michigan’s iron and copper industry during the 19th century. Mining was big in Cornwall, and immigrants offered their experiences and skills to the U.S. They became foremen who passed their skills along to newer waves of immigrants, including Finns. Michigan had the highest population of Finnish immigrants. According to Gary Kaunonen’s Finns in Michigan, about 308,000 emigrants left Finland for America between 1865 and 1914. Many Finns knew a rural life, but looked to the west for a better life after experiencing a series of agricultural blights.2 Michigan mines offered opportunity to Finns in much need of work. Upper Peninsula Michigan, USA, 1905. A map showing concentrations of Finnish American ethnicity in the United States. Image as based on the census 2000 by the U.S. Census Bureau. For Keith, pasties symbolize family and tradition. He recalls fond childhood memories visiting his grandparents in Menominee, eating pasties with his brother and cousins after an afternoon of running around and playing in the mud. He has watched his grandparents make pasties countless times, and has had the privilege of learning from Col. K himself. Keith and Grandpa Laurie, preparing the filling. 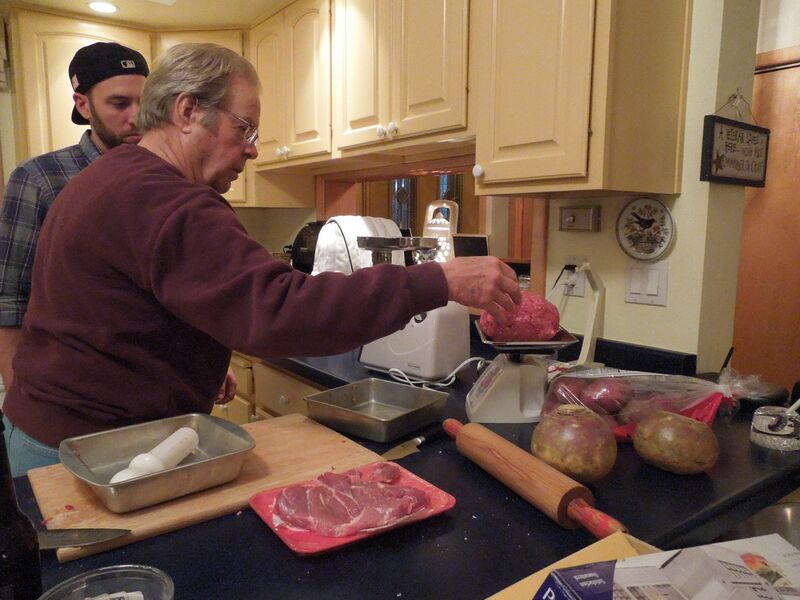 Making pasties with Keith and his grandparents was fun, but also admittedly stressful. Grandpa’s recipe is precisely measured, and his folding and crimping technique is meticulous. If he was going to teach you how to make his pasties, you were going to do it right. Could you expect anything less from the colonel? My anxiety gave way to terrible potato peeling that day, but I redeemed myself with my crimping. Grandpa Laurie learned how to make pasties from his mother Esther, who made them for her husband, a miner in the U.P. Esther was a born Yooper with Finnish parents. When she wasn’t tending to her family and home, Esther worked at a local grocery store in Ironwood, making and selling pasties and raspberry pies. She made her pasties for her family and her community, like many other Yooper women during her time. Who taught Esther? “Good question,” Sandy answered. “It’s like making toast.” Or as Keith explained to me, “It’s like making pancit in the Philippines. 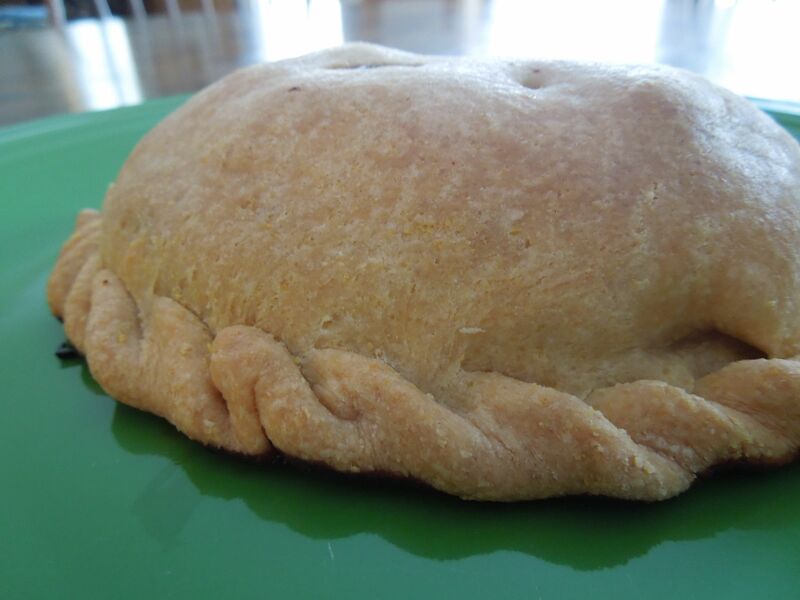 Everyone eats it and knows more or less how to make it.” The pasty is truly an American regional dish. Because pasties are a part of our family…so our kids don’t take food for granted, so they can appreciate the craft. Lockwood, Y. R. & Lockwood, W. G. “Pasties in Michigan’s Upper Peninsula: Foodways, Interethnic Relations, and Regionalism.” In A Taste of American Place, edited by Barbara G. Shortridge and James R. Shortridge. Oxford: Rowman & Littlefield Publishers, Inc., 1998. Kaunonen, G. “Finns Out, ‘Jack Pine Savages’ In.” In Finns in Michigan. East Lansing: Michigan State University Press, 2009. Reino, K. “Migration from Finland to North America.” In Finns in the United States: A History of Settlement, Dissent, and Integration, edited by Auvo Kostiainen. East Lansing: Michigan State University Press, 2014. Note: Auvo Kostiainen’s Finns in the United States: A History of Settlement, Dissent, and Integration is an excellent source reading about the Finnish-American experience. I didn’t even touch ethnic discrimination towards Finns or labor and socialist cooperatives. I could have definitely tied those topics to the pasty, but this is a blog post(ish), not my thesis.